A recent article in the New York Times (Erlanger 2016) describes ongoing “culture wars” in Israel aimed at limiting the influence of what the Israeli Right perceives as anti-Israel, anti-Zionist art produced by Leftist artists. The political salience of culture and its representation in the arts is particularly apparent in Israel, and the state regularly engages the arts community institutionally through the Ministry of Culture and Sport and the funding it provides (“billions of shekels a year,” according to the Ministry website (Israel, Ministry of Culture and Sport 2016). As noted in Erlanger’s Times article, other ministries play an important role as well. For example, the Ministry of Education decides which works of literature are to be taught in schools. Even the Ministry of Defense has a cultural role to play: Galgalatz, the Israeli army’s radio station http://www.glgltz.co.il/, is under the auspices of the Ministry of Defense, which rebuffed the attempt by Minister of Culture Miri Regev to control the station’s playlist. What is at stake here is the interplay of the arts, the state, and political contestation over national identity or, more precisely, national identities. What is Israel, who is Israeli, how can one legitimately be Israeli, what does it mean to re-script or re-depict “the Israeli”: These are all questions that are addressed by artists in the lively Israeli cultural scene. And while some art that emerges continues to promote a traditional Zionist vision, other works of art critically engage that vision. While the culture wars in Israel are in the news, the role of the arts in national identity constitution is not unique to Israel. The arts engage our emotions and so become powerful vectors transmitting feelings. Affective engagement through art with the nation can bind citizens to a particular feeling of patriotism. One needs only to think of national anthems, the poetry of their lyrics (Eyck 1995), their stirring melodies, and their entraining rhythms (Cerulo 1989) to find examples. Singing (or even just listening to) the national anthem is an embodied experience, and the physical act concretizes the abstract sentiment. The Marseillaise scene is the movie Casablanca (Curtiz 1942) has such power for that very reason. The national flag, too, can be seen as a work of art. Although citizens may not know the specific meaning of each of the flag’s symbols, the visual experience—seeing the flag—provokes a feeling of attachment. Art can also disrupt national identity, especially the national identity promoted by institutions of the state. Art can show us that we are “not like that,” with the “that” referring to current government practices to be rejected. For example, the American folksong movement of the 1950s and 1960s was pro-union, pro-civil rights, and anti-war: positions that stood in opposition to the status quo. Such protest songs were particularly popular on college campuses, thus further linking the identity of young adult to this new protesting identity (Rodnitzky 1969). It is particularly easy to see the way identity and art play out in the case of Israel simply because Israel is a new country and the efforts to formulate its national identity are easily accessible in the historical record. In 2002 and 2004, I taught a course called “Israeli Identity and State-Civil Society Relations: A Multi-Disciplinary Approach.” The focus was on how the arts mediated the constitution of Israeli identity beginning in the period of the Yishuv (the Jewish settlement in Palestine) and continuing through to recent times. Exemplar works from film, the visual arts, dance, literature, and music open conversations on facets of identity. In addition to assigning readings in the social science literature on national identity and specifically Israeli national identity (Shafir 2002; Almog 2000), I included reading poetry, watching films, listening to music, and looking at visual art. Because I am especially interested in how arts are experienced in an embodied way, I taught a couple of Israeli folkdances, which required students to stand up, push the desks out of the way, learn the steps, and move together to the music. This unusual pedagogical setting helped students connect to the subject matter. In the early days of the Yishuv, establishing an identity connected to the land of Palestine/Israel was an important social goal. 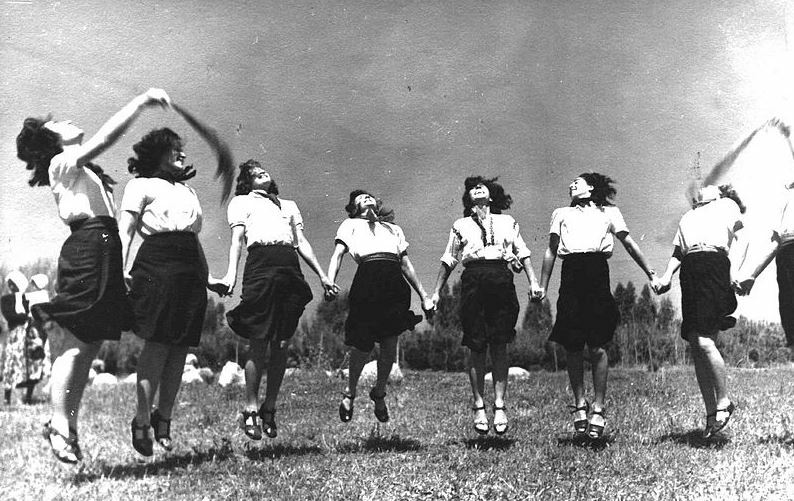 As an example, consider Hora Agadati, widely credited with being the first Israeli folkdance. According to the sociologist I interviewed in Israel while I was preparing the course, the dance was created because in the 1920s a group of Tel Aviv elites (including dancer and choreographer Baruch Agadati) decided that the Yishuv needed to have harvest dances. Why? Because other established nations had harvest dances. They understood the nation-making role of dance, especially of folk dance, that is, dances that could be mastered by people without special dance training. Hora Agadati, like other early Israeli dances, is simple. There are no complicated combinations of steps, rapid changes of direction, or turns. Hora Agadati does, however, require physical endurance, which points to another element of the identity constituting properties of the dance. It is intended to be danced by pioneering “New Jews,” Jews who have not become physically enfeebled by the poverty and persecution of diasporic life and through the religious ideal of long hours of study of sacred text. New Jews engage in farming, soldiering, and other physically demanding tasks. They are hale and healthy, and consequently well suited for contributing to the nationalist project of building a new state. (In the words of a different song, “we have come to the land, to build and be built there.”) The choreographer, I suggest, created this dance for New Jews (or aspiring New Jews). The choreography assumes that the dancers have the stamina to run and jump for several minutes, i.e., that they have a certain type of body, a body that will contribute to the nationalist movement and the eventual state’s power. This ideal developed in other artistic expressions. The paintings of Reuven Rubin, for example, often celebrate the connection of the human subject to the natural environment. Rubin immigrated to Palestine from Romania, and black and white photos of him suggest that his skin tone was that of a European. Yet in his self-portraits, he paints his skin brown, suggesting work in the fields or at the seashore (also popular subjects for him). The brown skin also suggests a connection to the Arab inhabitants of the land. He painted himself into the landscape as someone who belongs. By the 1930s and 1940s, the term “Sabra,” (a prickly pear cactus, spiny on the outside, sweet on the inside) had caught on to describe the ideal type of assertive, healthy, Israeli who embodied the Zionist ideal of the New Jew. Singing folksongs, according to Almog, was particularly important for constituting a Sabra identity: “Through words packaged in pleasing melodies the Sabra repeated by rote the values of love of the homeland while feeling a painful sweetness. The integration of beautiful melodies with patriotic Hebrew poetry spoke to the Sabra heart and became part of his internal code” (2000, 239). After the establishment of the state and the waves of migration in the following decades, the arts continued to express identity and identity contestation. An example is the film Fictitious Marriage (Buzaglo 1988), which exposes multiple identity cleavages. It is the story of Eldi, a middle aged teacher. He is a Mizrachi Israeli, that is, he is from a family that came from an Arab country. He speaks Arabic fluently and his physical appearance is more similar to the Arabs than to the Ashkenazi (European) Jews. He escapes from his routine life and ends up “passing” for both an Israeli living in New York and as a Palestinian day laborer. Other characters include an Israeli Arab who wishes to be accepted as truly Israeli, an Israeli Jew who wishes she were living in New York, and yet another Israeli Jew who tries to live out a fantasy of having an affair with a Palestinian—but the “Palestinian” she chooses is none other than Eldi passing as a Palestinian. Gender, class, and even geographic identities (Jerusalem, Tel Aviv, Gaza) are part of the story, as well. The artistic works of today that are the subject of the contestation mentioned in the New York Times article include Parallel Lives, a play written and directed by Bashar Murkus that explores the daily lives of Palestinian Israelis in prison. Central to the story is the experience in prison of Walid Daka, an Israeli Palestinian who has been serving a life sentence for a crime he says he did not commit (participating in the abduction and murder of an Israeli soldier). For Arab-speaking audiences, the play engages identities of being an Arab, being imprisoned (and perhaps falsely convicted), and being subject to a discriminatory state, among other themes. Murkus translated the play into Hebrew and put on a performance for a Hebrew-speaking audience. For some of these audience members and for some who heard or read about the play, the play provides unacceptable challenges, including, they claim, support for a terrorist (Eldar 2015). But it is not just the dissident artists on the left of Israeli society that are, to the right, problematic. The current government is attempting to pass legislation that defunds all “disloyal” art—a term that seems to apply very broadly to any art that raises disquieting counter claims to the dominant Israeli national identity. Minister of Culture Miri Regev includes the work of distinguished Israeli Jewish authors like Amos Oz and David Grossman in that category (Mualem 2015). Identities matter for imagining how and what the nation-state is and what policies it pursues, and having vibrant contestation on identities is a positive element of a democratic society. By engaging identities critically, the arts are part of the democratic deliberation within a complex national culture. There is substantial state funding for the arts in Israel, and so I am not surprised that the Israeli polity becomes a site of battle for what art is acceptable. We’ve seen similar culture wars over National Endowment for the Arts funding in the United States. I believe democracy is deepened by works of art that destabilize otherwise settled assumptions about identity. I’m saddened by culture wars that seek to silence dissident voices, but I’m not surprised. Daliah dancing festival, Israel 194? At the outset, I must add a caveat. What follows is a selective discussion of identities, art, and politics in Israel. My intent in this brief article is to suggest some ways in which art may have consequences for social construction of identities for individuals and for the nation. I have selected cases because I find them to be illustrative of my arguments rather than necessarily representative of all arguments. I neither cover all variants of Israeli identity nor do I go into much detail on the implications of the sometimes fraught diaspora–Israel identity relationships. I also only hint at similar dynamics in other nations. A more expansive treatment of these themes is beyond the limited scope of this paper. A clip of that scene can be found here, https://www.youtube.com/watch?v=KTsg9i6lvqU (meetbee 2016). A video of Israeli choreographer and dance instructor Gadi Bitton teaching Hora Agadati followed by a demonstration of the dance, with music, by a small group can be found here, https://www.youtube.com/watch?v=-xaHnjSBNbc (accessed January 29, 2016) (Bitton 2016). The song can be heard here, https://www.youtube.com/watch?v=SRf8C0aRekU (accessed February 5). (Sarah Ya’ari n.d.). An example of a Rubin self-portrait can be found here, https://www.flickr.com/photos/32357038@N08/6152510301/ (accessed February 4, 2016) (Rubin 1922). Almog refers to “To the Top of the Mountain.” I believe he means “Shir HaMa’apilim” (The Song of the Illegal Immigrants).” A version can be found here, https://www.youtube.com/watch?v=6frkzQEipro (Zemereshet 2016). Note that the setting for this video is a communal singing event, an activity that is common is Israeli culture, although perhaps more previously than in the present day. See also an interesting unpublished paper by Weisinger on this song (Weisinger 2016). Almog, Oz. (2000) The Sabra: The Creation of the New Jew. Berkeley: University of California Press. Bitton, Gadi. (2016) Hora Agadati—Rikudai Am L’matchilim ([Israeli] Folkdance for Beginners). <https://www.youtube.com/watch?v=-xaHnjSBNbc&gt; (Accessed 4 February). Buzaglo, Haim. (1988) Niśuʼin Fiḳṭiviyim (Fictitious Marriage). Videodisc release of the motion picture. Sisu Home Entertainment. <https://catalyst.library.jhu.edu/catalog/bib_2586221&gt;. Cerulo, Karen A. (1989).. Sociopolitical Control and the Structure of National Symbols: An Empirical Analysis of National Anthems. Social Forces 68 (1): 76-99. doi:10.2307/2579221. Curtiz, Michael. (1942) Casablanca. Warner Bros.
Eldar, Shlomoi. (2015) Haifa’s Arab Theater Shocked by Uproar over Play. Al-Monitor, May 7. <http://www.al-monitor.com/pulse/originals/2015/05/israel-al-midan-theater-haifa-play-palestinian-prisoners.html&gt;. Erlanger, Steven. (2016) Israel, Mired in Ideological Battles, Fights on Cultural Fronts. The New York Times, January 29. <http://www.nytimes.com/2016/01/30/world/middleeast/israel-mired-in-ideological-battles-fights-on-cultural-fronts.html&gt;. Israel, Ministry of Culture and Sport. (2016) Subsidies. <http://mcs.gov.il/English/Pages/Subsidies.aspx&gt; (Accessed 29 January). meetbee. (2016) La Marseillaise Casablanca. <https://www.youtube.com/watch?v=KTsg9i6lvqU&gt; (Accessed 4 February). Mualem, Mazal. (2015) Is Israel’s Culture Minister Drunk with Power?—Al-Monitor: The Pulse of the Middle East. Al-Monitor, June 12. <http://www.al-monitor.com/pulse/tr/originals/2015/06/israel-culture-minister-regev-right-agenda-leftist-artists.html&gt;. Rodnitzky, Jerome L. (1969) The Evolution of the American Protest Song. Journal of Popular Culture 3 (1): 35–45. Rubin, Reuven. (1922) Self-Portrait with a Flower (Rubin Museum, Tel Aviv, Israel). Oil on Canvas. <https://www.flickr.com/photos/32357038@N08/6152510301/&gt;. Sarah Ya’ari. (n.d.) Anu Banu Artza (We Come to the Land). <https://www.youtube.com/watch?v=SRf8C0aRekU&gt;. Shafir, Gershon. (2002) Being Israeli: The Dynamics of Multiple Citizenship. Cambridge, U.K.: Cambridge University Press. Weisinger, Akiva. (2016) The Intellectual History of The Maapilim. <https://www.academia.edu/3596865/The_Intellectual_History_of_The_Maapilim&gt; (Accessed 5 February). Zemereshet. (2016) Hama’apilim (El Rosh HaHar) (The Illegal Immigrants (To the Top of the Mountain)). <https://www.youtube.com/watch?v=6frkzQEipro&gt; (Accessed 4 February).